Pen and crayon from an old school notebook. My first 'real' drawing. From the Bounty Hunter game commercial. The last two were done a few years ago as sketches for my art class. Really nice drawings. How long have you been sketching or drawing? Hi bobagirl91. Welcome to the boards! Eurycea posted that artwork in mid-2009, so they might not chime in to reply to you. Oh, ok, I hadn't even noticed the date I was just impressed with the artwork. Thank you for letting me know. 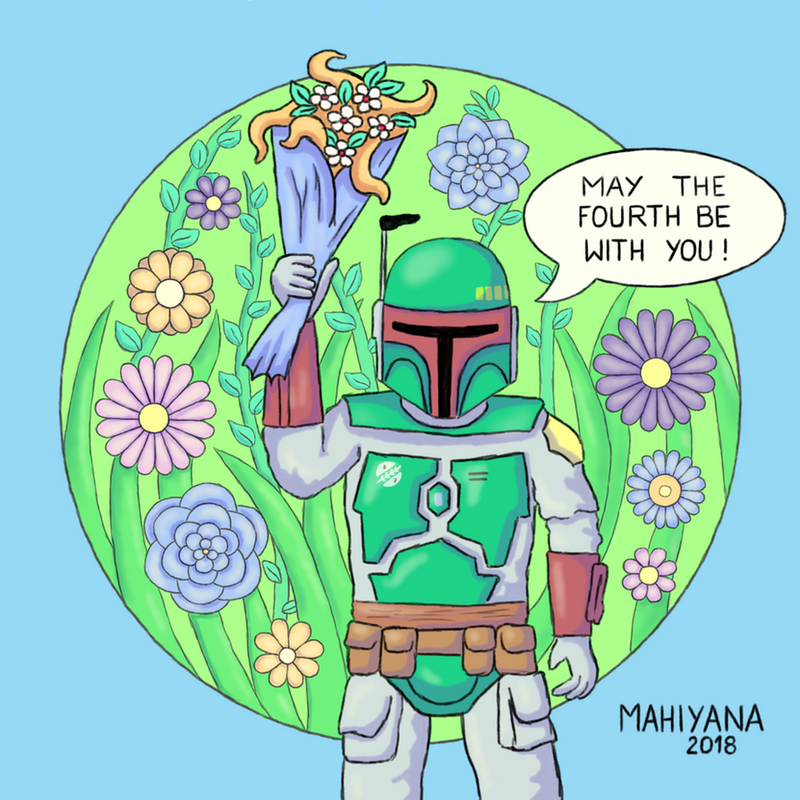 I don't know if anyone knows her, but Cat Staggs has been doing a lot of Star Wars art over the last several years. I was introduced to her artwork at the last San Diego Comic Con I attended, a few years ago. 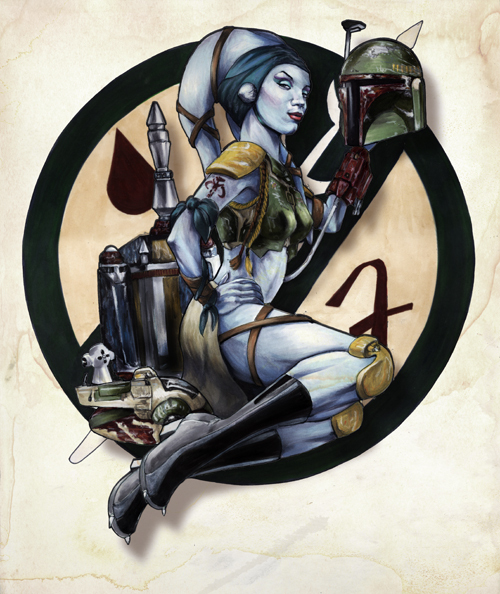 She had some really nice Boba Fett artwork on display (one of which I bought right before the show ended). Anyway, she has a pretty cool Deviant Art Page. Yesterday, she posted this little jem on there. Pretty freakin' sweet. Wish they'd make this into some posters. 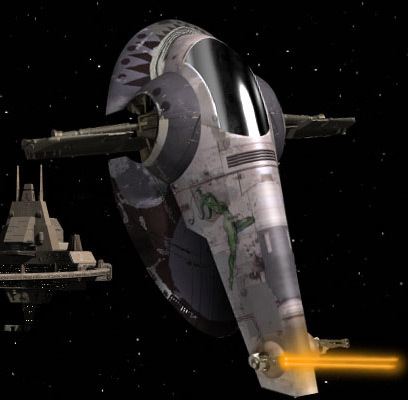 I was thinking it'd be some pretty cool nose art to go on the side of the Slave 1, kind of like the Andrasta. I ran into that first picture last night, actually! Heh. Yeah, I don't know what it is about the blue Twi'leks. All the other ones are cute, but the blue ones.....Mmmmmmmmmm. Cat did say on her Facebook page that the original concept for it was based on nose artwork, so that was pretty neat. I guess that explains the pose. I notice they have quite a few Twi'lek girls on the nose art of the Republic Gunships on the Clone Wars cartoon. Pretty cool. Glad you like it. Hopefully, my unmasked piece of Fett will turn out as epic in the end. I deepened the detail a bit and finished off detailing his gear. Now I just need to shade and color the background. I've done a few with charcoal, yes. But I'm not overly fond of the medium. awsome stuff mate You really have some good skills... Good sense of drawing and sketching...! 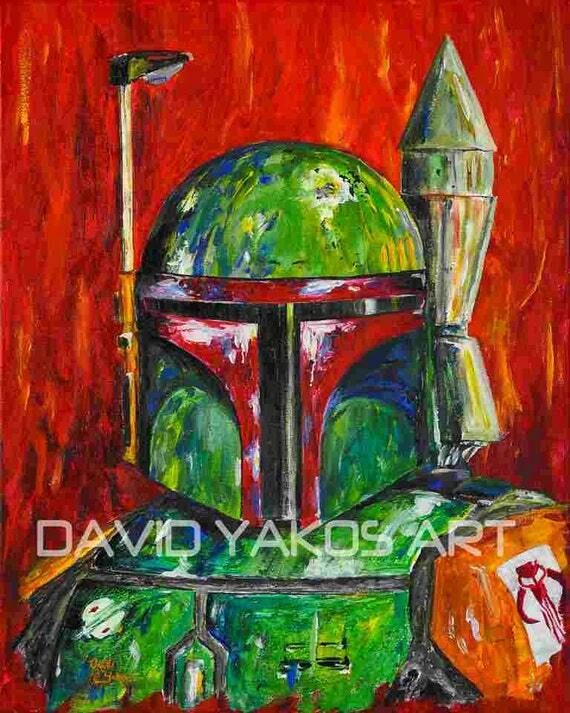 I'm new to the group here but I just finished this painting of Boba Fett. I hope you all enjoy it. Hey Montana! Thanks for joining BFFC. And thanks for giving us the head's up about your artwork on our Facebook page, too! Welcome to the club, Vincent! Here is Boba Fett after getting out of Sarlacc Pit. Friend of mine requested this mash up, one of my most entertaining projects. Hopefully Acast03 will try again to upload here.